Less than twenty miles from our Western MA bed and breakfast is a special place known as Hancock Shaker Village. The third village created by the Shakers after their arrival in the New World in 1774, Hancock is a testament to the Shaker commitment to beauty, simplicity and hard work. The architecture of the twenty historic buildings is not fancy, but the symmetry and craftsmanship are awe-inspiring. One look at the round barn, and it is clear that these humble people had something special. 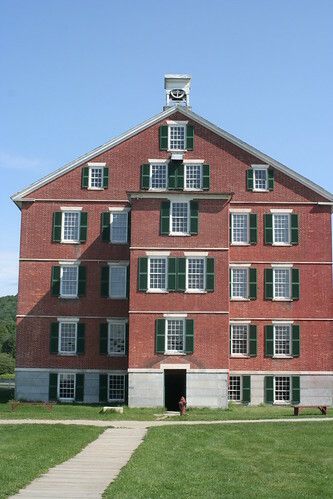 Take time to visit Hancock Shaker Village while staying with us at our Berkshires inn. Learn about the handful of Christians who left Manchester, England, in order to settle where they would be allowed to practice their religion and celibate lifestyle in peace. Witness the many contributions the innovative Shakers made to the greater community thanks to their creativity and industriousness. Eat Shaker inspired food at the cafe. Walk among those glorious buildings. The Hancock Shaker Village is open for self-guided tours until the first of November. After that, through the month of November the village is open for guided tours only.